Product #18094 | SKU ATOMCAL001 | 0.0 (no ratings yet) Thanks for your rating! 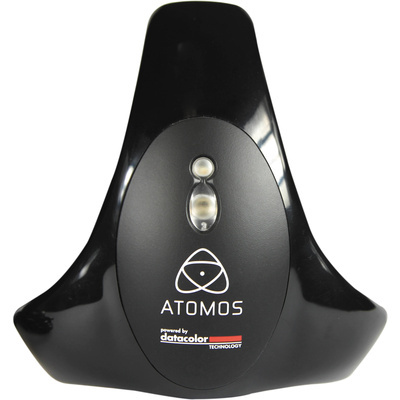 The Atomos Spyder Color Calibration Unit is a portable one-touch calibration device designed specifically for use with the Samurai Blade Monitor and Recorder. Featuring a precise seven-sensor design, the Spyder is capable of calibrating to the SMPTE Rec. 709 color space with a D65 white point with 100% gamut, as well as C-Log profiles. Once initially calibrated, the ability to customize gamma, lift, and gain per channel enables further control of the color settings of the monitor to match personal settings. A USB to LANC serial cable is included for connecting the Samurai Blade to a computer, and the Spyder is then connected via USB as well. Once connected, calibration occurs for precise, accurate, and consistent color representation to benefit a more streamlined workflow from capture to editing. The Spyder can also be used as a conventional calibration unit on other monitors when used with optional Datacolor software. Designed specifically for use with the Samurai Blade monitor and recorder for true and consistent color values when working on location. Seven-sensor design enables extreme precision in regard to accurate color rendition. Calibrate to 6500K ITU-Rec. 709 white point with delta-E better than 2 down to 20% gray. Manual adjustment of lift, gain, and gamma per channel allows fine-tuning of color settings based on personal preferences. USB to LANC serial cable connects Samurai Blade to Windows or Mac computers for automatic color calibration. Re-calibrate every two weeks to ensure a consistently accurate color profile. Can be used as a conventional calibration unit for other monitors or computers when paired with optional Datacolor software.